Notes: The Yamaha HS8 is the new flagship model of Yamaha's HS series of active studio monitors, taking its cues from the ever popular and much demanded NS-10. The Yamaha HS8 Active Studio Monitor features biamplified full range 2 way speakers rated at 75W and 45W and has been developed by Yamaha to offer an exceptionally flat and accurate frequency response for use in music production and composition as well as the home project studio. The HS range of monitors has been designed in the same tradition of the legendary NS10M monitors. Yamaha HS8 speakers feature a low resonance bass reflex enclosure which improves the rigidity of the overall speaker, and less cabinet resonance means that the signal remains clear and uncoloured. This is very important in getting an accurate mix which translates across all systems. Port noise has also been audibly reduced by up to 6dB using the new Yamaha proprietary technology right across the HS range, which also helps to deliver a clean and precise signal. The HS8 is equipped with XLR and TRS jack connectors as well as room control and hi trim response controls. Multimedia monitors with professional sound quality and features in a compact design, acoustic pads and cables included! Notes: Built using only premium, high-performance components and featuring convenient front-panel controls, Mackie Creative Reference Multimedia Monitors deliver professional sound quality and features perfect for work, play and everything in between. You might be creating professional multimedia one minute and streaming video the next. With Creative Reference Multimedia Monitors, you get the best of both worlds. Studio-quality design and performance in an extremely compact design with smart features perfect for creatives of any level. Creative Reference monitors deliver a combination of high-quality components and professional build quality that is typically only found on more expensive studio monitors. From the studio-quality sound of the premium drivers to the rich, natural sound enhanced by the all-wood cabinet design, these monitors are professional in every way. After all, when creating media, it's critical that your audio translate accurately across the myriad of speakers people will use to listen. Even if you don't create media, you want to hear exactly what the product intended. Hear every nuance and detail in a complete full-range experience that only studio monitors can provide. Let's face it... a lot of workspaces are cramped. Maybe you work at home, maybe you like to work remotely or maybe you sit for hours a day in a tiny editing suite. Either way, great-sounding monitors that don't eat up a ton of desk space would be ideal. The extremely small footprint of Creative Reference monitors is perfect for the modern workspace. They are very compact, but they don't sacrifice a bit on performance. Unique to the line is a left/right speaker placement switch that lets you decide which side of your workspace has the volume control. Sometimes you just feel more comfortable reaching up to change the volume with a specific hand. Mackie is the first to solve this issue. Maybe it's because there are so many ambidextrous people here...something in the Seattle water. It's also fantastic for home studios, where you can be forced to put the powered monitor on a particular side due to where the power outlet is. Either way, you don't want to sacrifice proper stereo imaging due to personal preferences or space limitations. There are also some great front-panel features that make Creative Reference monitors ideal for creative professionals and media junkies. The front panel volume knob also allows you to turn the monitors off, which is better than reaching around back each time you use them. There's even a lit power ring around the knob to let you know when the monitors are ready to rock (or jazz, or whatever it is you're into). An auxiliary input is perfect for connecting your smartphone or other media device to audition previous mixes or other comparison media. Plus, if you want to quickly watch the latest video your friend shared on Twitter, you can just plug in and enjoy. A dedicated headphone out provides the opportunity to quickly listen to a different source, which is great for any professional. Plugging in phones defeats the speakers for truly silent work and you can quickly adjust levels with the main volume knob. Notes: The Yamaha HS5 is a new addition to Yamaha's HS series of active monitors, influenced by the critically acclaimed and highly sought after NS-10 studio monitor speakers. Notes: The new Genelec 8010 allows professionals to work in compact studios and on the move with an accurate monitoring tool. 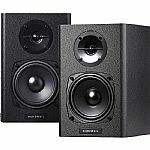 Notes: Kurzweil is pleased to present the new affordable compact self-powered KS-40A monitor speakers. The Kurzweil KS-40A system is a solid value, competing favorably with other monitors in and above its price range. Kurzweil believe the most accurate sound comes from the right combination of ingredients. Housed in a heavy, thick-walled and non-resonant wood cabinet, the Kurzweil KS-40A speakers sport a magnetically shielded 2-way bass reflex design and a compact footprint. Featuring a premium 3/4" dome tweeter and wide-range 4" woofer, 20W RMS system amplification and separate volume and bass adjustments, the Kurzweil KS-40A system is an ideal monitoring solution for the personal project studio or keyboard setup. High frequencies are crisp and clear, low frequencies are balanced and warm, imparting a transparent sound to the Kurzweil KS-40A with equal amounts of presence and clarity. For musicians who are on a budget but are unwilling to compromise when it comes to sound quality, the KS-40A speakers are the perfect choices. Notes: The Eris E5 2 way active 5.25" studio monitor from PreSonus delivers an accurate response with tight bass and a clear upper end. The Kevlar low frequency transducers, low-mass silk-dome tweeters and responsive Class AB amplification combine with acoustic-adjustment controls to create a versatile and adaptable listening system. The E5 begins with a front-ported enclosure made of vinyl-laminated MDF. It features a 5.25" Kevlar low-frequency driver mated with a 45W, Class AB amplifier. For the highs, the Eris employs a 1" silk-dome tweeter powered by a 35W, Class AB amplifier. The E5 outputs a clean 102 dB peak SPL. Its frequency response is rated at 64Hz to 22kHz. The Eris E5 provides a balanced XLR, a balanced 14" TRS, and an unbalanced RCA line-level input. Once you're plugged in, set the input gain and you're ready to go. The Eris provides 3-EQ controls in its acoustic tuning section: high, mid, and low cutoff. These controls enable you to fine-tune the monitors to your space. The low control also is useful when using the E5 with a subwoofer. The High control is a shelving filter that boosts or cuts all frequencies above 4.5kHz by as much as 6dB. The mid control is a mid-frequency peak filter that boosts or cuts frequencies centered at 1kHz and extending about one octave above and below that frequency. The low cutoff control rolls off frequencies below either 80 or 100Hz at a slope of 12dB/octave. This control is especially useful if you also have a connected subwoofer. A 3-position acoustic space switch controls a second-order, low shelving filter that cuts frequencies below 800Hz by either 2 or 4dB to compensate for the boundary bass boost that occurs in close proximity to walls or corners. The RF shielding protects against radio frequencies that could be introduced to the signal and become audible. The Eris monitors also provide overheat protection, current-output limiting and subsonic protection. The Soft startup amplifiers prevent damaging pops from sounding through the speakers when you power them up. Notes: Linear frequency response. Zero coloration. Transparency. Headroom. To hear the truth, you need reference speakers that offer up. Your studio monitors deliver, but what about when you're on the go? What if there was a reference monitor that could free you from the confines of the studio walls and provide you the truth in your music no matter where you are - mixing in a small makeshift recording space, mastering in a hotel room, working in your own studio, or composing on the go? Wouldn't that be sweet? iLoud Micro Monitors are two extremely portable, high-performance bi-amped speakers that deliver a combined 50W RMS of power for superior bass, plenty of headroom and an expansive stereo image. Whether you're recording, editing, mixing, or mastering audio, iLoud Micro Monitor ensures your mix will translate well to the huge variety of consumer devices - headphones, home stereo systems, gaming consoles, car audio systems, TVs, and other listening systems. With iLoud Micro Monitor, you will hear the truth in your music no matter whether you're mixing, mastering or just listening to your favourite tunes at home. And best of all, it offers its portability, power and flexibility at a price that's affordable for everyone. When the original iLoud Bluetooth speaker was released, it set a new standard for portable power and sonic accuracy. iLoud Micro Monitor is a natural evolution of that design, and just like its highly popular predecessor, it offers a completely new and unmatched portable sonic experience. Its two speakers are powered by ultra-efficient class D power amplifiers that push a combined 50 W RMS of power. Each speaker sports a 3/4" silk dome tweeter, a 3" paper-cone performance woofer and a large-flaring front-firing bass reflex port. Thanks to these features, it's able to deliver pleasing high frequencies, an exceptionally "open" midrange and a solid and controlled low end. Simply put, iLoud Micro Monitor's sound is so good that it's nearly inconceivable for a speaker system of this size and at this price point. iLoud Micro Monitor sounds amazing and real. But why? Well, a part of that is due to its internal 56-bit digital signal processor (DSP). This DSP is responsible for things like taking care of the frequency and phase response of the monitor as well as also controlling the dynamic range so that the drivers are always controlled. It also acts as a digital crossover that allows for invisibly smooth transitions between the drivers themselves. You're bound to come across all sorts of listening environments when you're on the go. Most speakers can't handle this kind of variety, but iLoud Micro Monitor can. Its internal DSP is controllable thanks to three dedicated EQ switches. You get switches for bass and treble as well as a "DESKTOP" compensation switch - this lets you switch between a "free field" and "desktop" setup effortlessly. You can also position iLoud Micro Monitor at two angles of inclination, so you can optimize your listening experience to suit the characteristics of the room you're working in. You can easily use iLoud Micro Monitor with all your favourite gear. Sending an audio signal to it couldn't be easier. It has inputs for both RCA and 1/8" connectors, and it can also be paired via Bluetooth to any Bluetooth-enabled device. With all of its inputs, you'll always be able to use its ultra-linear sound to monitor your music no matter where you are or what device you're using. Reference monitor sound anytime and everywhere - iLoud Micro Monitor makes it possible. Its two speakers make for one incredibly small and portable system that delivers exceptional sound in any environment. Their compact size make for the perfect monitoring system to use while traveling with your laptop. They easily pack up into a gig bag or backpack so you can use their phenomenal sound anywhere. Notes: PreSonus Eris-series studio monitors are used worldwide by audio engineers who need to hear every detail of their recordings. Ideal for gaming and home video production, the Eris E3.5 employs the same technology as the larger Eris models to deliver studio-quality sound, with a smooth and accurate frequency response. Yet they're compact enough to fit almost anywhere. Every Eris-series studio monitor utilizes a custom-woven Kevlar low-frequency driver. The weave and nature of the Eris E3.5's 3.5-inch Kevlar woofer result in a more constant dispersion pattern throughout the frequency range, resulting in less time-smeared audio and cleaner overall sound. A speaker's response is affected by where you place it and the acoustics of your space. That's why Eris E3.5 active media reference monitors offer easy-to-adjust high- and low-frequency controls. A convenient front-panel volume knob sets both the speaker level and the integrated headphone amplifier level. Be careful with that volume knob, though: Eris E3.5s are driven by an onboard 25 watt/side power amplifier and can get a lot louder than you may expect, while still delivering clear, accurate audio. With three different types of audio inputs, it's easy to feed audio to your Eris monitors from a mixer, an interface, a media player, or almost any other line-level source. The Eris E3.5 is equipped with rear-panel, 1/4-inch TRS and RCA inputs, as well as front-panel 1/8-inch stereo, unbalanced line inputs for use with mobile audio devices. With this selection, you'll have no problem hooking your Eris speakers up with virtually any line-level source, including your smartphone or tablet. The loud, clear, front-panel headphone amplifier lets you work and play in stealth mode, without disturbing your housemates. Like all PreSonus monitor speakers, the Eris E3.5 offers consistent, accurate listening, with the smooth and even frequency response that has made Eris monitors popular around the world. Their compact and powerful design makes them an ideal solution for any small space. Notes: Ever since the 1970's the iconic white woofer and signature sound of Yamaha's nearfield reference monitors have become a genuine industry standard for a reason - their accuracy. Unlike studio monitors with added bass or treble frequencies which may sound more flattering at first, HS Series speakers were designed to give you the most honest, precise reference possible, providing an ideal sonic platform to build on throughout the mixing process. Notes: When workspace is at a premium, don't compromise on quality. With the 8020D, Genelec's renowned accuracy and reliability will fit your project and your space. 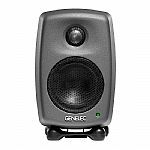 The Genelec 8020D is small in dimensions, but big in ambition. The 8020D, introduced in 2017, even delivers 4 dB higher SPL and has a lower energy consumption than earlier models of 8020. Designed to suit the broadest possible range of listening environments, 8020D thrives when space is at a premium, and draws on the innovation of the 8000 Series for an unrivalled near-field experience. Trust in the colour-free, accurate reproduction of the Minimum Diffraction Enclosure (MDE), while relying on the precise on- and off-axis frequency reproduction of the Directivity Control Waveguide (DCW). And when you're finished, Genelec Intelligent Signal Sensing (ISS) circuitry detects when your system is no longer in use, placing it into an environmentally friendly, power-saving standby mode. From post-production studios to OB vans and DAW-based rooms, the 8020D is your near-field solution of choice. 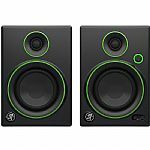 Notes: Alpha studio monitors are specifically designed for music creation. Thanks to Focal's exclusive technologies, its expertise in terms of speaker drivers and to the mechanical design of Alpha studio monitors, optimum integration is guaranteed. The environments for music production are very diverse, they are not optimised acoustically, or have only been done so insufficiently, and the listening distances vary greatly. Whether for confined spaces, rooms with poor acoustic qualities or for styles of music, which require neutrality, dynamics and high SPL, Alpha studio monitors are the solution for you. This is reflected in the choice of technologies used, such as the inverted dome tweeter, that provide a very linear treble, reveal the slightest imperfections of equalisation even from a short distance away and also prevent auditory fatigue ; the Polyglass cone woofer, which gives excellent damping qualities, ensuring flawless neutrality over the entire bass/high-midrange frequency spectrum, and a remarkable transparency to the midrange frequencies ; and the unique bass-reflex design with large double front ports, which improves acoustical integration even in confined spaces nor installed near a front wall. Finally each Alpha studio monitor is equipped with two class AB amplifiers. The high-current amplifiers enable complete control of the dynamics of the audio signal. This also allows for listening at high volumes without distortion. The ALPHA 50 is composed of a 5" (13cm) woofer/ midrange speaker with a Polyglass cone loaded in a large laminar port and of a 1" (25mm) aluminum inverted dome tweeter. It features a 20W amplifier for the tweeter and a 35W amplifier for the woofer, and has a frequency response of 45Hz to 22kHz (+/- 3dB). Notes: Shape 65 is the reference of the Shape line. Although it's dedicated to nearfield monitoring, this monitor enables extraordinary monitoring quality, in the lowest to the highest frequencies. Simply a must, this monitor will express its full potential from a listening distance of three feet away (1 metre). Notes: A studio monitor is no ordinary loudspeaker. Unlike a conventional speaker, a true monitor must be unerringly accurate, with a flat frequency response and vanishingly low distortion. It has to tell you, the music producer - dependably and unquestionably - exactly what is or is not in your recording. In a studio-grade monitor speaker, there is no place for the usual list of speaker colorations and limitations prevalent in conventional loudspeakers. Response peaks\dips, uneven polar response, high THD, nasal midrange, bloated mid-bass, and crossover-induced phase incoherence do nothing but undermine the confidence demanded for superior mix performance. Introducing M-Audio's BX5-D3 monitors-the return of a studio icon and the successor to the industry-renowned BX-D2 monitors. Trusted by recording/mix engineers and composers globally, M-Audio's BX monitors guarantee absolute surgical precision and repeatable engineering excellence. Listen with confidence: with M-Audio's BX5-D3 studio reference monitors, you'll hear everything in lifelike detail, so your mixes and recordings will sound their best! A monitor's drivers are the heart and soul of its performance. Driving the low-end and midrange, BX5-D3's 5-inch military-grade Kevlar woofers are rigid and lightweight, delivering outstanding transient response whist negating unwanted "cone breakup." BX5-D3's treated silk dome tweeter provides the perfect combination of low mass and the absence of audible resonances that plague conventional tweeters. Together, the BX drivers deliver critical detail, nuance and dynamic accuracy, so your mixes have the veracity and transparency you demand. With M-Audio's BX5-D3, every detail has been meticulously engineered with one goal in mind - to facilitate the freedom to mix with confidence. BX5-D3 monitors have a rearmounted bass port, meticulously engineered to the exact length and diameter. The result? Deep, defined bass response with maximum bass extension and resolution. When combined with a smoothly-flared port, BX5-D3 monitors markedly reduce the audibly-intrusive air turbulence that results when bass is played back at high sound pressure levels (SPLs). BX5-D3's tweeter is mounted in a custom waveguide for reliably accurate dispersion that eliminates unwanted high-frequency "scatter," whilst ensuring a soundstage that remains consistently wide and stable. For seamless setup and easy location of the optimum listening position, the BX5-D3's front-mounted positioning LED shines brightly when you're located in the perfect listening spot, for uncompromisingly accurate and reliable critical evaluations. Finally, BX5-D3's iconic design on the front panel-M-Audio's famous "keyhole" shape-is more than just an attractive look: This special "fastenerless" design ensures so there are no driver attachment screw heads to interfere with the sound coming from our drivers. At M-Audio, we understand no two listening spaces are the same. Therefore, the BX5-D3 monitors custom tailors your sound to your environment, so you will always experience sonically-true, reassuringly-accurate sound reproduction. Negate problematic bass frequencies and limit the impact of nuisance standing waves thanks to BX5-D3's special Acoustic Space control for precise adjustment of BX5-D3's sound output in line with your studio space. Whatever your needs, the BX5-D3 Studio monitors guarantee to assimilate into your existing setup with ease. Combining conveniently-located, rear-mounted XLR and 1/4-inch balanced inputs, BX5-D3 connects to virtually all studio equipment including mixers, interfaces, DJ gear and more. Notes: TASCAM's VL-S3 bring great-sounding compact studio monitoring to the price of a set of headphones. The 2-way powered monitors include a 3" woofer, and rear ported design packs a surprising punch. A pair of RCA inputs accept any line-level input, and a stereo 1/4" to RCA cable is included. Also available is a 1/8" stereo mini jack for playing from smartphones or MP3 players. The efficient 14W per side stereo power amplifier drives the two monitors. The compact, ported cabinets fit almost anywhere. Ideal for home studios, dorm rooms, or video editing suites, the VL-S3 is an affordable solution for great-sounding mixes. Even with professional 2-way drivers and rich power amplifier, the footprint is a compact 4.5" x 6.7" (110mm x 170mm) - perfect on a desktop or next to your laptop PC. There's no need to make space for speaker stands. The compact monitors can fit below many monitors or in crowded machine or server rooms. Even though they're priced like standard PC desktop speakers, the VL-S3 provide professional monitoring quality. With a frequency response of 80 HZ to 22 kHz, every sound is faithfully reproduced - from the body resonance of a bass drum to a tinkling wind chime. The wide response is reproduced by the 2-way system design - consisting of a woofer, tweeter, and the bass reflex port located on the rear of the cabinet. Designed specifically for desktop systems, the integrated 14 W + 14 W power amplifier provides you not only powerful, full volume monitoring, but also features well-balanced sound at low volume. The VL-S3 work great in areas where excessive volume might be a problem, such as bedrooms, dorm rooms, and apartment buildings. The dual RCA inputs provide a common, compact interface for connecting with unbalanced sources. A 1/4" stereo phone plug to RCA conversion cable is included for sources like an audio interface or Portastudio with a 1/4" phone output jack can be interfaced. The VL-S3 also includes a 1/8" stereo mini input jack, which automatically shuts off the RCA inputs. Using a standard stereo mini cable, a portable MP3 player, iPad or smartphone can be connected. Alesis Elevate 3 studio speakers deliver full-range sound with impressive clarity and warmth to all your mixes, masters and multimedia content. Elevate 3 speakers bring out every detail of the sound, unencumbered and crystal clear. Unlike conventional speakers that use vibration-prone plastic cabinets, the Elevate 3's dense wood cabinets suppress clarity-robbing resonances, resulting in clearer sound and stronger bass. Elevate 3 studio speakers contain powerful, three-inch woofers and crisp-sounding one-inch silk-dome tweeters that deliver full lows, clean highs and a precise stereo image. The internal amplifier is custom-designed and equalized to work perfectly with the Elevate 3's drivers, for impressive impact and output capability. For ease of operation, the Elevate 3's on/off/volume knob is conveniently located on the front panel of the right speaker. Packaged in stereo-matched sets, Elevate 3 studio speakers give you everything you need, all in one box. Alesis has been creating studio monitors for nearly a quarter century. In that time, we've learned a thing or two about optimizing sound and sonic clarity. Built using technology adopted from our award-winning Monitor One and M1Active professional studio monitors, Elevate 3 studio speakers are the perfect way to upgrade your computer or mobile device experience. Elevate 3 speakers leverage Alesis' experience in designing studio loudspeakers by employing custom-designed components that reproduce sound accurately and naturally, regardless of the frequency content or volume. On the rear panel is a pair of rugged RCA jacks, perfect for connecting mixers, interfaces, and other audio gear. A 1/8-inch headphones jack lets you defeat the speakers' sound for private listening at any time. Connecting the speakers is easy, using just a standard 1/8-inch cable (included). Elevate 3 studio speakers are accurate and smooth, but if you need a little more low-end punch, a convenient bass-boost switch does the trick. If you need even more power and low-end extension, Elevate 3 features a subwoofer output compatible with virtually any outboard powered subwoofer. Trust your sound to the clarity, precise design and premium performance of Alesis Elevate 3 studio speakers. Alesis has been creating studio monitors for nearly a quarter century. In that time, we've learned a thing or two about maximizing sound and sonic clarity. Built using technology adopted from Alesis' award-winning Monitor One and M1Active professional studio monitors, Elevate 5 studio speakers are the perfect way to upgrade your computer or mobile device experience. Elevate 5 speakers leverage Alesis' experience in designing studio loudspeakers by employing custom-designed wood cabinets that stay natural and neutral, regardless of the frequency content or volume. Notes: The Eris E44 and E66 deliver an expanded and highly accurate frequency response and the widest stereo field available in their class. Their nested Midwoofer-Tweeter-Midwoofer (MTM, also known as "D'Appolito") configuration offers improved off-axis response and spatial resolution. The result is a more consistent listening experience, smoother frequency response, and an ultra-wide, detailed stereo soundstage. Conventional 2-way designs can cause significant early reflections from their surrounding environment. The E44 and E66 overcome this by positioning a 1.25", silk dome high-frequency driver between two 4.5" (E44) or 6.5" (E66) midrange drivers. The two smaller woofers work in parallel to partially contain the dispersion of the tweeter, minimizing phase displacement. The result is incredibly detailed stereo imaging. Both the E44 and the E66 feature two midrange drivers that cover the same frequency range. The drivers are placed so that their acoustic centers are less than one wavelength apart for any of the frequencies they reproduce; as a result, the combined signal of both drivers propagates forward like a single waveform. This makes the comparatively small midrange drivers in the E44 and E66 behave like a single, larger driver. This mutual coupling provides a highly dynamic output in a compact footprint. Sound waves radiating from the two components in a conventional speaker design can interfere with one another, creating peaks at some frequencies and dips at others, and these will vary depending on where the listener is relative to the speaker. In an MTM configuration, component interference, and the sonic inconsistencies that go with it, are minimized. This affords listeners an ultra-wide sweet spot and a more consistent listening experience on- and off-axis. The E44 and E66 utilize custom-woven Kevlar low-frequency drivers. This provides a more constant dispersion pattern throughout the frequency range, resulting in less time-smeared audio and cleaner overall sound. The weave and nature of the dual Kevlar woofers also helps break up reflected energy, so fewer delayed reflections reach the listener's ear. In conjunction with the MTM configuration, this works to create a transparent, cohesive sound. With three different types of audio inputs, it's easy to feed audio to your Eris monitors from a mixer, an interface, a media player, or almost any other line-level source. The Eris E44 and E66 provide balanced XLR, balanced 1/4" TRS, and unbalanced RCA line-level inputs. With this selection, you'll have no problem hooking your Eris speakers up with virtually any line-level source. Like all PreSonus studio monitors, the Eris E44 and E66 offer consistent, accurate listening. The ultra-wide stereo image afforded by their MTM design, makes them an ideal solution for any one who requires best-in-class spatial resolution. 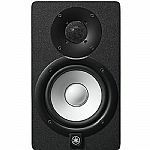 Like the rest of the Eris studio monitors, the E44 and E66 set a new standard for affordable studio monitors. Notes: The next-generation JBL 305P MkII compact powered studio monitor makes legendary JBL performance available to every studio. With the revolutionary JBL Image Control Waveguide and refined transducers, JBL 305P MkII offers stunning detail, precise imaging, a wide sweet spot and impressive dynamic range that enhances the critical listening capabilities of any modern workspace. Featuring patented technologies derived from the JBL 7 Series and M2 Master Reference Monitors, and sporting a sleek, modern design, JBL 305P MkII delivers outstanding performance and an enjoyable mix experience at an accessible price. Notes: JBL One Series 104 monitors draw from seven decades of JBL Professional engineering to deliver an innovative new speaker, designed from the ground up. With the JBL 104 reference monitors, JBL started with the mission to give content creators the ability to hear all the details for results while mixing and editing. JBL One Series 104 monitors achieve this through innovative, newly engineered JBL 4.5" coaxial drivers that provide full range performance for crystal clear highs and deep bass, without a subwoofer. This new coaxial driver has been specially contoured using the same research that led to the revolutionary waveguide found in M2, 7-Series, and 3-Series monitors, and like these monitors, One Series also provide listeners with a wide, immersive sweet spot and an accuracy never before heard in monitors at this price point. With JBL 104 Reference Monitors, you'll hear true clarity and detail, with no coloration. The 104s deliver crisp highs and rich bass just as intended. They're optimized for desktop placement, with neutral low-frequency performance. And their smooth off-axis response means you can monitor with confidence in a wide sweet spot. The world's top recording studios and touring artists rely on JBL Professional monitors to deliver unparalleled fidelity and performance. Now, we've optimized that technology in our smallest form factor ever. The 104 Reference Monitor's innovative new coaxial driver design features a high-frequency driver aligned with a precisely contoured woofer cone to deliver accurate response, exceptional detail and impressive off-axis performance, for the most neutral, accurate presentation, desktop to desktop, room to room. The cabinet's precisely contoured low-frequency port works with the driver to provide accurate bass at all listening levels. And with low frequency extension down to 60 Hz, you'll be impressed with the bass you get, even without a subwoofer. JBL 104 Reference monitors offer this high level of performance, even at loud playback levels. This is accomplished through clean, integrated 60-watt Class D amplification that distributes 30 watts per speaker. And with their efficient design, One Series speakers can be driven to 104db SPL (peak), without the distortion found in other monitors in their class. And JBL One Series reference monitors were created with the modern production lifestyle in mind. They not only feature a sleek, new look for JBL, but with their compact size, creators can get legendary JBL sound even in smaller workspaces. Smart features like a front-panel volume control allows convenient level adjustments without straying from the sweet spot, the front-panel headphone jack automatically mutes the speakers, providing isolation in one simple step, and dual 1/4-inch balanced and single 1/8-inch unbalanced TRS inputs accommodate a wide range of sources. Linear frequency response. Zero coloration. Transparency. Headroom. To hear the truth, you need reference speakers that offer up. Your studio monitors deliver, but what about when you're on the go? What if there was a reference monitor that could free you from the confines of the studio walls and provide you the truth in your music no matter where you are - mixing in a small makeshift recording space, mastering in a hotel room, working in your own studio, or composing on the go? Wouldn't that be sweet? Notes: The next-generation JBL 306P MkII powered studio monitor makes legendary JBL performance available to every studio. With the revolutionary JBL Image Control Waveguide and refined transducers, JBL 306P MkII offers stunning detail, precise imaging, a wide sweet spot and impressive dynamic range that enhances the mix capabilities of any modern workspace. Leveraging patented technologies derived from the JBL 7 Series and M2 Master Reference Monitors and sporting a sleek, modern design, JBL 306P MkII delivers outstanding performance and an enjoyable mix experience at an accessible price. Reveal impressive detail, ambience and depth in your mixes thanks to the ground-breaking JBL Image Control Waveguide. Originally developed for JBL's flagship M2 Master Reference Monitor, this patented innovation ensures an acoustically seamless transition between the low- and high-frequency transducers and provides an immersive soundstage with precise imaging. Offering a broad sweet spot and neutral frequency response, JBL 306P MkII delivers a crystal-clear representation of your mix - revealing subtle details, even when listening off-axis. To help you make the best mix decisions, JBL equipped the 306P MkII with acclaimed 3 Series transducers that now perform even better. Hear deep, accurate and tightly controlled bass thanks to a long-throw 6.5" woofer and the patented JBL Slip Stream low-frequency port. Enjoy soaring, immaculately detailed highs via the woven-composite 1" Neodymium tweeter. JBL engineers took things to the next level with faster HF transient response through fine-tuned ferrofluid damping, and greater low frequency linearity and lower harmonic distortion courtesy of an enhanced woofer design. The result is a studio monitor you can trust - with unmatched peak handling, stunning dynamics and neutral frequency response that's unbeatable in its class. JBL 306P MkII is ready for the most demanding production styles right out of the box. Dual integrated Class D power amplifiers, custom designed by JBL for each transducer, give you generous dynamic range for any project. From music production and podcasting to cinematic sound design or daily vlogging, enjoy the output and power you need to hear exceptional detail at any volume - even at peak SPLs. Simply plug in, power on, and start creating. The dimensions and acoustics of a room can have a major effect on sonic accuracy, and that's why JBL 306P MkII lets you adjust the response to fit your studio. The new Boundary EQ attenuates the low-end boost that can occur when you place monitors directly on the desktop or near walls. The 3-position HF Trim switch allows you to adjust the high-frequency response of the 306P MkII to tailor it to room acoustics or personal tastes. The design of the 306P MkII leverages over 70 years of JBL acoustic expertise to create a refined studio monitor at an outstanding value. While other manufacturers use off-the-shelf components and make subjective decisions about the sound, JBL builds speakers that squeeze every ounce of performance from each component to deliver efficient, accurate sound reproduction. 306P MkII is designed to JBL's Linear Spatial Reference criteria - a series of 72 individual measurements taken 360 degrees around the speaker to ensure a faithful reproduction of your mix, whatever your listening environment. JBL Professional studio monitors are designed for reliable performance, even when projects push your gear to the limit. Before being approved for production, 3 Series monitors must first pass JBL's strenuous Power Test. Each model is required to perform flawlessly at maximum volume for an unheard-of 100 hours - without failure. Notes: Channelling the spirit of the legendary Yamaha NS10 nearfield speakers, the HS5I monitors offer exceptional detail and clarity with a superb flat response. 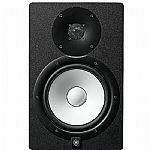 This edition of the best-selling HS5 Monitor Speaker includes built-in mounting points, making it compatible with two optional bracket types for wall and ceiling mounting - offering the flexibility needed for a wider range of sonic environments. The HS Series features newly developed transducers that achieve astonishingly smooth response over a wide bandwidth. These transducers utilise an advanced magnetic field design that regulates the flow of magnetic response to provide seamless, natural sonic transitions. Every component's materials and design have undergone an extensive cycle of development, re-examination and optimisation resulting in staggering gains in signal reproduction accuracy across the audio spectrum. The enclosures are constructed from a specific dense and resilient MDF with a damped acoustic response perfectly matched to reference monitoring. Drawing from over a century of acoustic piano making, Yamaha have employed a traditional 3-way metered-joint technique. Common to architectural design, this construction firmly anchors the corners of the enclosure to dramatically improve durability and eliminate unwanted resonance. The 'I' Editions of the HS Series feature flexible mounting options that help bring a stylish aesthetic and classic HS sound to a more diverse range of installed applications. Channelling the spirit of the legendary Yamaha NS10 nearfield speakers, the HS8I monitors offer exceptional detail and clarity with a superb flat response. This edition of the HS8 speaker features mounting points for wall, ceiling and baton brackets - perfect for installations in studios, public spaces and retail environments. The HS Series features newly developed transducers that achieve astonishingly smooth response over a wide bandwidth. These transducers utilise an advanced magnetic field design that regulates the flow of magnetic response to provide seamless, natural sonic transitions Every component's materials and design have undergone an extensive cycle of development, re-examination and optimisation resulting in staggering gains in signal reproduction accuracy across the audio spectrum. Notes: IK's iLoud Micro Monitors stunned an industry. Producers and engineers at every level marvelled at the performance coming from such a small setup, so IK challenged our team to push its concept even further - to design a new compact speaker to rival 5", 6" and even 8" monitors. The result is iLoud MTM, and it changes everything about the sound, accuracy and convenience of reference monitors in today's modern studio. Once you hear iLoud MTM, you'll find it hard to ever go back to traditional big-box speakers. The first job of any studio monitor is to deliver accurate, un-coloured sound so you can trust your mixing decisions will translate across multiple playback systems. iLoud MTM uses the most advanced DSP techniques to provide total control over the speakers' performance, delivering results simply not obtainable with traditional analogue designs. Highs are neutral and defined, mids are clear and balanced, and lows are as balanced as ever. You can mix for hours with no ear fatigue, and the work you create will translate better than ever. And of course, it's loud, with 100W RMS total power per speaker and 103dB SPL maximum sound pressure, delivering the proven volume the iLoud brand is known for. iLoud Micro Monitor wowed the world with the bass performance it delivered from a 3" speaker that "defied physics". But iLoud MTM offers even more, with even bass response down to an astonishing 40Hz ideal for modern music styles. iLoud MTM debuts IK's new patent-pending Physical Response Linearization (PRL) system, that uses a precise model of the enclosure's design, construction and materials, combined with electro-mechanical measurements of the real units, to correct the system's performance in real time. The result is a stunningly "firm," balanced and defined low end, to surpass the sound of speakers even twice iLoud MTM's size. Deep bass is solid and firm - you won't believe sound like this comes from a monitor so small. Most conventional studio monitors, even high-end designs, suffer from skewed phase response caused by traditional, phase-shifting crossovers and driver/enclosure phase alterations. The end result is an unfocused stereo image, blurry transients, and overall lack of detail. iLoud MTM leverages IK's two decades of DSP experience to offer a true phase-coherent response across the useful frequency spectrum, for unbelievably realistic, natural sound like you've never heard. You'll hear instruments and dialogue as if it's happening live, discover more detail in your tracks than ever before, and stop wasting hours trying to EQ away issues with your mixes that were never really there. This linear-phase response is rarely found in speakers even several times iLoud MTM's price, and has to be heard to be appreciated. iLoud MTM uses a midrange-tweeter-midrange symmetrical design, with a pair of 3.5" high performance woofers and one 1" high definition, back-chamber loaded tweeter, which provides ultra precise, defined, point source sound that can't be achieved by traditional 2-way systems at close distances. This means an even more natural, life-like sound, where the speakers "disappear" and you can focus on the music. It also minimizes the ear fatigue caused by traditional 2- or 3-way designs, where different frequencies arrive at your ear at different times. So you can mix longer, with less effort. iLoud MTM's design also offers exceptional sound dispersion, enhancing the transparency and neutrality of what you hear. Today's studios can be anywhere, from acoustician-designed spaces to a spare bedroom. Too many speaker manufacturers keep designing for ideal acoustic environments, ideal positioning and large listening distances. But many musicians simply don't have that luxury. iLoud MTM offers built-in acoustic self-calibration via the included ARC reference microphone, to automatically adjust the frequency response to its placement. Just set up the monitors, put the microphone in your preferred listening position, press a button and you'll instantly have a custom calibration for the sweet spot of your listening environment. iLoud MTM uses audiophile-grade high resolution algorithms and the top-of-the line A/D converters to carefully manage cross-overs, filtering, time alignment, equalization, dynamics control and auto-calibration. Totally DSP-controlled and precision time-aligned, iLoud MTM also manages the off-axis response to manage the effects of room reverberations. Notes: The XR624 6.5" Professional Studio Monitor from Mackie is designed to reveal your true mix in a way that feels natural and accurate without the fatigue monitors can bring after long hours at the mixing desk. It can be used in various applications for recording studios, video production houses, voice-over studios, and more. The monitor has XLR and TRS audio inputs and a 45 Hz to 22 kHz frequency response. For clarity, it features an XR logarithmic waveguide that matches the dispersion pattern of the 6.5" Kevlar woofer for midrange transition, which recesses the 1" tweeter so that its active area is on the same axis with the woofer. It provides the acoustic alignment of high and low frequencies for balance. The ELP Bass Reflex System utilizes an extended length, internally curved design that provides extended low-frequency response and increased output capability, even at high volumes without any "air noise", which plagues typical ports. Also, the monitors are easily adaptable to suit your mixing environment with three adjustable switches: Acoustic Space, HF filter, and LF filter. Finally, the XR series monitors are equipped with a rigid, ultra-low distortion Kevlar woofer that maintains its shape even under a high amount of stress. This provides fast recovery from transients and accurate, detailed low-end. Notes: The Samson MediaOne M50 Powered Studio Monitors are a full-range speaker solution for all your desktop and multimedia applications. Whether you're listening to music, producing tracks, watching videos or gaming, this stereo monitor pair features an internal amplifier, solid wood construction and high-quality components that bring big, balanced sound to your desktop space. Each MediaOne M50 monitor features a 5.25" polypropylene woofer that provides tight lows, complemented by a 3/4" silk-dome tweeter housed in a custom waveguide that adds smooth highs with a wide sound stage. The result is a system with a balanced frequency response and stunning full-range audio. Additionally, a Bass Boost switch allows users to enhance the lows. Based on Samson's 20 years of experience designing professional studio monitors for recording studios around the world, the MediaOne M50s are powered by an internal 80-watt (40 watts per channel), studio-grade A/B amplifier to produce robust, detailed sound. Also, wood cabinet construction with rear porting ensures maximum efficiency and low response without mechanical power loss. Connect a mixer, audio interface, computer or mobile audio device to the system's rear stereo RCA and 1/8" inputs. A front panel headphone jack mutes the speakers for private listening sessions. In addition, a 1/8" (3.5mm) output allows you to integrate a powered subwoofer with the MediaOne M50s to create a 2.1 system.